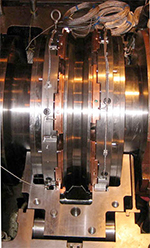 When senior management at a Pennsylvania utility was dissatisfied with the performance of a steam turbine's main thrust bearing, Kingsbury engineers recommended a Chrome-Copper Leading Edge Groove (LEG) thrust bearing to replace it. Then they designed and installed it in just 13 weeks to meet the utility's stringent schedule. 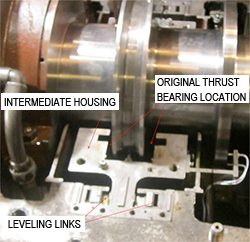 The original thrust bearing was a unique design consisting of symmetrical taper land thrust plates enclosed in a floating housing. The outer diameter of the bearing housing included a large axially centered flange that engaged leveling links mounted in the turbine housing. Wide fluctuation in measured thrust bearing temperatures (200° +/-20°F (93° +/- 11°C)), combined with repeated thrust bearing failures and limited spare parts availability led to the conclusion that a more reliable and serviceable design was needed. Senior plant management began the search for an better design. During a brief maintenance outage, Kingsbury, Inc., personnel had approximately 90 minutes to evaluate the machine as well as to document and measure the existing bearing. This was the only access the Kingsbury team had until it was time to install the new bearing! The thrust bearing load was unknown. The oil flow to the thrust bearing was unknown. The internal dimensions and tolerances of the bearing housing were unknown. The condition of the thrust collar was unknown. The customer imposed a maximum allowable thrust bearing operating temperature. There was absolutely no flexibility in the customer's schedule; failure to meet the delivery date meant that the contract defaulted. Due to these requirements, the new thrust bearing had to be a conservative design with maximum installation flexibility. All potential obstacles had to be identified and planned for since there would be no time to deal with unexpected surprises. Based on the site measurements and the information available, Kingsbury engineers roughed out a bearing design. In order to meet the temperature requirements and account for all variables, several designs were considered. The high load capacity and low oil flow requirements made a 28.75" (730.3 mm) (8x8) Chrome Copper Leading Edge Groove (LEG) thrust bearing the best solution. The operating performance of this design was evaluated, taking into consideration a range of oil flows from near starvation levels to completely flooded conditions, under loads of up to 2 times the estimated rating of the original design. Once the bearing design was selected, an intermediate housing that could orient the bearing assembly, accommodate the thrust load, and fit into the machine housing had to be devised. Multiple Finite Element Analyses (FEA) were conducted to optimize the housing load carrying capacity. Radial adjusting pads and axial filler plates were introduced in the intermediate housing to increase installation flexibility. Senior management from the utility reviewed multiple proposals, and awarded the contract to Kingsbury, Inc.
Production began immediately after the contract was awarded, and new challenges began to surface. Customary material suppliers could not meet the delivery requirements, so other suppliers had to be sourced and qualified. Some in-place machining was anticipated for new temperature sensor lead wire paths, but upon disassembly, the thrust collar surfaces were found to be distressed and out-of-tolerance, increasing the amount of in-place machining required. Many internal design reviews were held, as well as countless web meetings between Kingsbury, Inc., and the customer's Corporate Engineering, Maintenance, and Contractors. This communication was instrumental to keeping the schedule on track. Aside from the hardware deliverables, the customer required an Operation, Installation and Maintenance Manual for the new bearing, as well as on-line bearing training. The bearing and housing were assembled at the factory to ensure procedural accuracy and minimize installation challenges. Once manufacturing was complete, Kingsbury Service Engineers arrived at the utility with the new bearing. They worked for 8 days, often around the clock, to fit the new intermediate housing and bearing into the turbine housing. The time from contract award to assembly installation was 13 weeks. The schedule and all technical requirements had been met. Under full load, the eight instrumented thrust shoes in the active thrust subassembly reported a temperature of 190° +/- 4°F (88° +/- 2°C), a significant improvement over the original design and well within customer expectations.